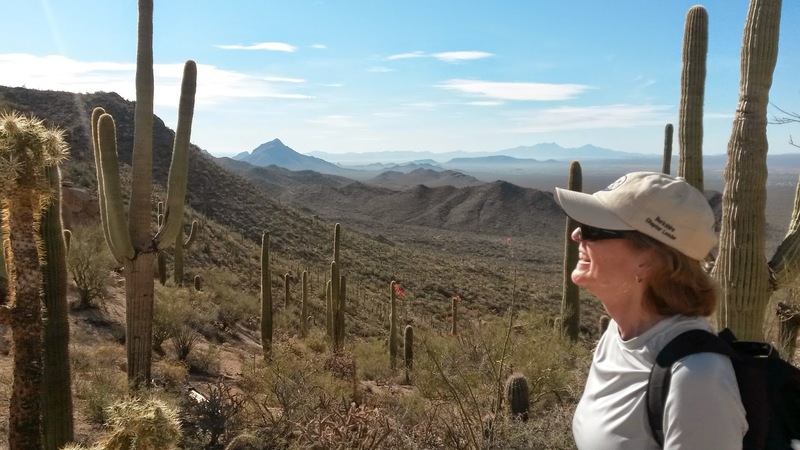 I just spent 10 days in Tucson, Arizona, hiking and exploring the city and environs. What a different ecosystem from the Berkshires! I went with the Appalachian Mountain Club Adventure Travel. These are volunteer-lead trips for hikers. More about them here, then click on More Options. The glorious open views, the wildlife, the sunshine and the wonderful company of other hikers made for a great trip. 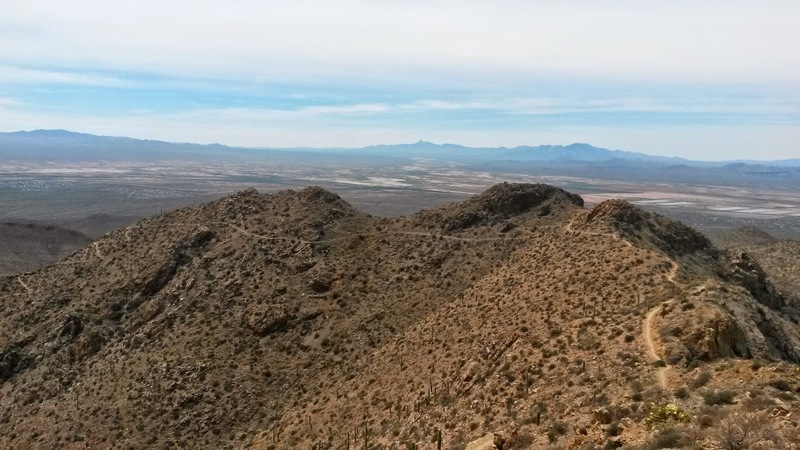 Tucson is surrounded by mountain ranges including the Santa Catalinas, the Tucsons and the Santa Ritas. We hiked in these three. We were in the Sonoran Desert which covers much of south-western Arizona, part of southern California and south-western Mexico. The saguaro cactus, very tall with arms, grows only in the Sonoran Desert and we saw lots of them. You know them from cowboy movies. 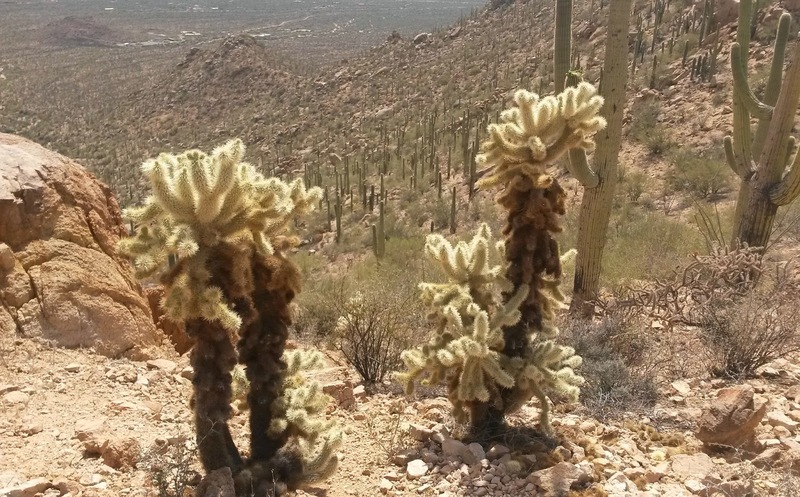 They are slow growing, reaching 40-60 feet, and are protected in Arizona. 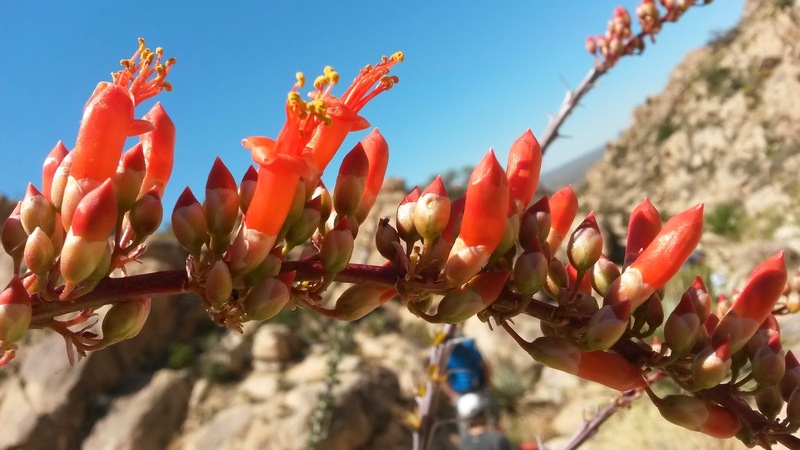 Although desert, the countryside is filled with birds, lizards, snakes, animals, shrubs, cacti, flowers and other species. Each has its own way of adapting to the small amount of water—about 10 inches a year. Fascinating! one specimen was found to weigh 9 tons! on this ridge line trail. Looking back along the ridge on the way to Wasson Peak, Tucson Mountains. I loved seeing all the Saguaro Cacti along the trail. 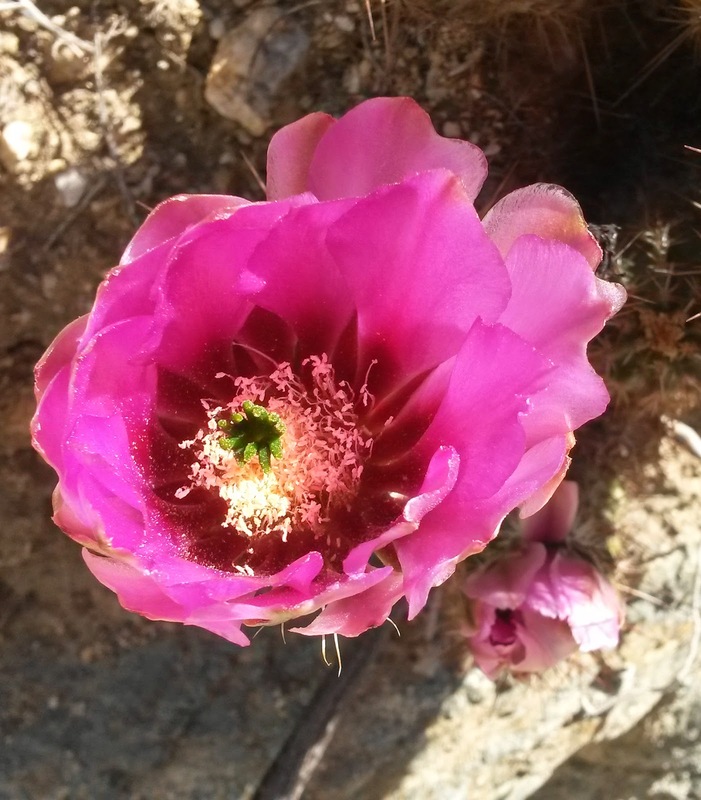 The large and intensely-colored Prickly Pear Cactus blossom. 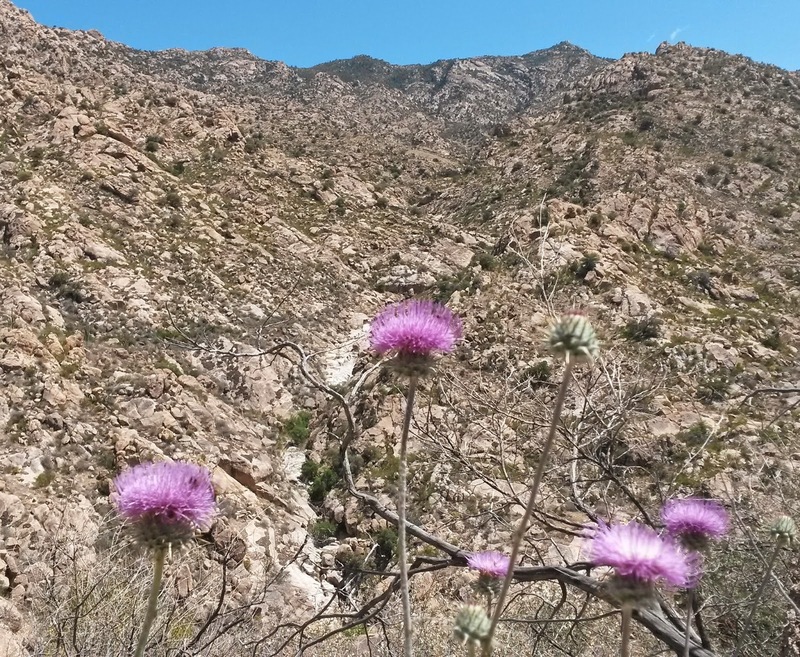 Flowers added bright spots of color to the rocky desert landscape. 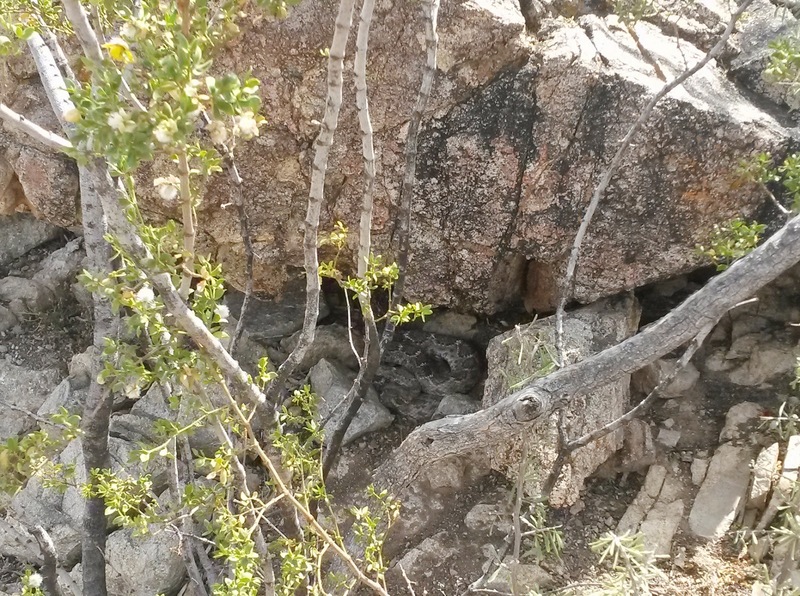 Hidden in the crevice of a large boulder was a Western Diamond-Backed Rattlesnake. He rattled his tail at us and we respected his space! We tried to avoid the very spiny Chollo Cactus. Such a different landscape from my Berkshire home!